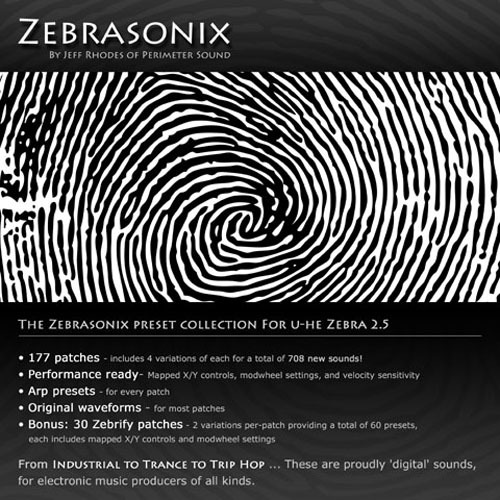 'Zebrasonix' is a preset collection for U-He Zebra 2.5 soft synthesizer created by Jeff Rhodes of Perimeter Sound. From Industrial to Trance to Trip Hop... these are proudly 'digital' sounds for electronic music producers of all kinds. These synth patches and effects presets are not emulations of classics. They are meant to be original sounds with enough performance controls to give them a bold new life of their own. The velocity sensitivity settings alone will keep them from ever getting static, and when you add the mod wheel, and the X/Y pads, you'll never run out of inspirational new sounds.